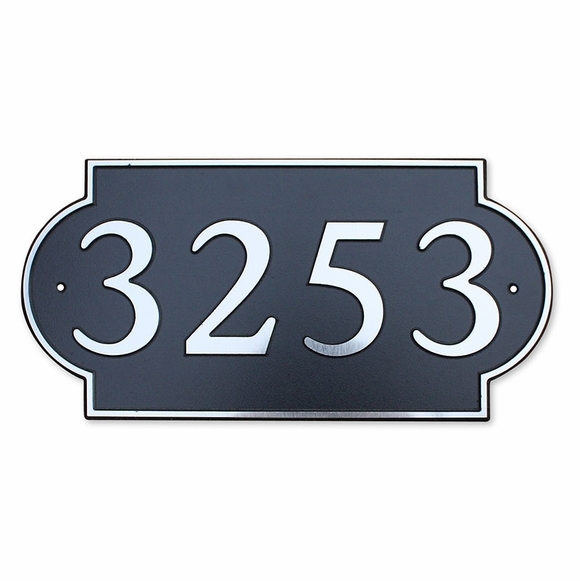 Personalized Home Address Sign - - custom-engraved house number sign at an affordable price. Wall mount. Made in USA. Holds one or two lines of custom engraved text. Comes in two sizes: 12"L x 6"H and 16" x 8"H.
The 12" x 6" plaque holds up to fourteen (14) characters on each line. Character count includes spaces and punctuation. For example, 652-L has five characters. The 16" x 8" plaque holds up to fourteen (14) characters on each line. Character count includes spaces and punctuation. Maintenance-free plaque is made of fade-resistant composite plastic. Custom engraved plaque holds one or two lines of personalization.